Musashibō Benkei, a monk of Mount Hiei, plans to fulfil a promise by paying a visit to Gojō Tenjin (or possibly Kitano Tenmangū Shrine or Jūzen-ji Temple). However, his retainer advises him against doing so because a monstrous manslayer has appeared on the bridge at Gojō and is killing passersby. Initially Benkei agrees to give up his plan, but on further reflection, worries that people might think he is intimidated. He decides to get rid of the manslayer and waits for nightfall. At night, when Benkei arrives at Gojō Bridge, Ushiwaka, dressed in female kimono, is laying in wait for passersby. Benkei mistakenly supposes that Ushiwaka is a woman and therefore, having taken vows as a monk, avoids interacting with Ushiwaka. Ushiwaka slashes at Benkei, who fights back with his long-handled sword. The agile Ushiwaka attacks and subdues Benkei. Finally giving up, Benkei asks Ushiwaka who he is. Ushiwaka reveals his identity, and the two men pledge themselves to be master and subordinate. They go back together to Ushiwaka’s house in the Kujō area. This piece is based on an extremely well-known Japanese legend, the story of how Ushiwaka (Minamoto no Yoshitsune) and Benkei met for the first time on Gojō Bridge. The original version of the legend says that Benkei, intending to collect one thousand swords, attacked people bearing swords night after night on the bridge. On the night that he only needed to get one more sword to reach his goal of 1,000, he met Ushiwaka, who was playing a Japanese flute. 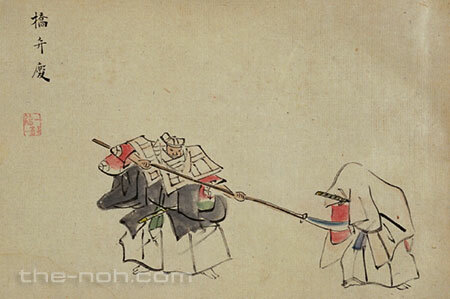 Being tossed down by Ushiwaka, Benkei surrendered to him and became his subordinate. However, in this Noh drama, Ushiwaka is the manslayer, something monstrous and supernatural. Benkei is shite (the lead actor) and Ushiwaka is kokata (a child performer). Also, this is a rare piece in that it has no waki (a supporting actor). The climax of this drama, the battle scene between Benkei and Ushiwaka, comes in the later half. Your eyes will be glued to the powerful, gallant sword fight between the child performer and the lead actor. 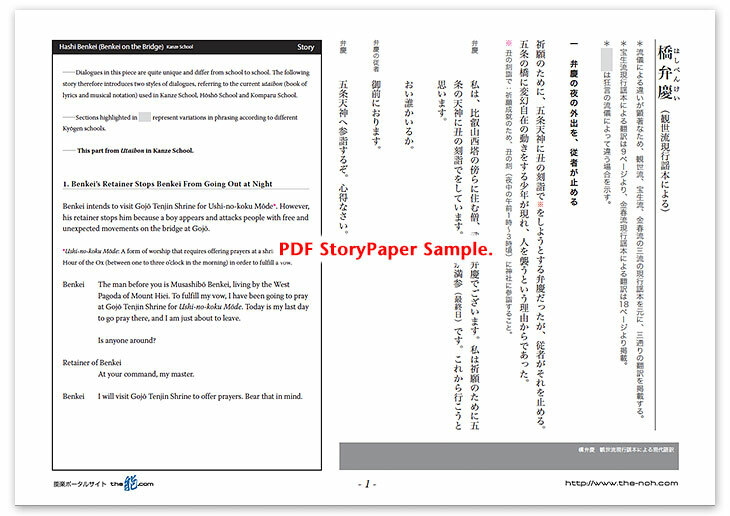 Also, this play is often selected for the very first practice song of novice Noh reciters, because its length is perfect and it is composed of easy lyrics and light melody. You may have several opportunities to see this drama. It is a well-known story, performed frequently, and rather easy to understand. This is a wonderful Noh play for beginners, as well as those who just started to practice Noh, to enjoy watching and listening to the chants.